Megumi no Daigo, directed by Susumu Nishizawa. 43 minutes. January 22, 2000. 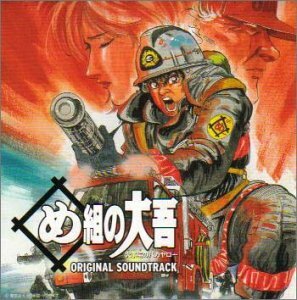 Or Me Gumi no Daigo, since Megumi here is an abbreviation for Medaka Gumi #2, Firefighting Company #2, which just happens to be located near fictional Sengoku City’s Megumi subway station. It’s a pun. 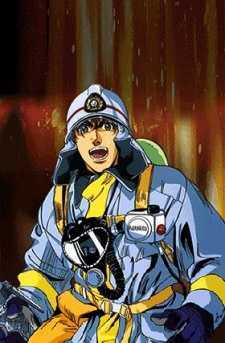 This is Daigo of the Firefighting Company, a 45-minute OAV based upon the manga Firefighter! 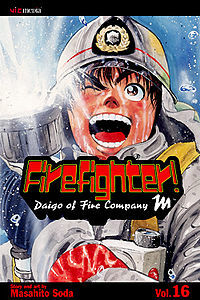 Daigo of Fire Company M, by Masahito Soda. Company M was another pun; the M stood for Manga. A very minor OAV based on an equally minor manga. The manga was published in the U.S., by Viz Media, after it won the Shogakukan Manga Award in 1996 for Best Boy’s Manga of the Year. But it had no following in America. Who cared about a manga about a Japanese fireman when there were so many manga of more dramatic s-f adventures? The protagonist of Megumi no Daigo is 18-year-old Daigo Asahina, a rookie firefighter in the Emergency Rescue Squad of Medaka Gumi #2. When Daigo was a child, his life was saved by a nameless fireman who congratulated him for saving his puppy. Daigo vowed to become a firefighter himself when he grew up. However, his reckless behavior and his impulsive nature when he becomes excited (every time he is in a firefighting situation) are risking getting him thrown out of Medaka Gumi #2 before he even becomes a full firefighter. The beginning of the OAV, showing Medaka Gumi #2 in action through minimal animation, emphasizes how lackluster this OAV is. This is a pity, because in other ways this is an excellent OAV. The voice acting, sound effects, and Shirō Hamaguchi’s music performed by the Warsaw Philharmonic Orchestra are all top-notch. So was the decision to limit the plot to one of the least exaggerated incidents in the manga. They grew increasingly dramatic but improbable as the manga continued – such as Daigo trapped in a smoke-filled building with a maddened tiger. The OAV starts with a fire at the Megumi Shop above the Eastline Market, across from Sengoku City’s Megumi Station. Seven people are trapped on the 5th floor. Chief Gumi is shown in the red cap, and newspaper reporter Okano and his photographer are in the crowd outside. The Fire Station’s ladder trucks are caught in a traffic jam and can’t get through. Fortunately, the 5th floor is above the fire and the Station’s lift crane is present. The trapped people are told to await evacuation by the lift crane; do not risk jumping onto the fire department’s emergency air mattress! Suddenly one of the firemen with the people on the 5th floor begins grabbing them and throwing them out toward the air mattress below, despite shouts from the other firemen to stop. Just as he is finishing, an explosion overwhelms the 5th floor. The opening credits are shown over a flashback to a fire at Daigo’s home when he was a boy. Daigo insisted on running into the house to save his puppy, Jiru. He was scolded, but the only thing that he remembers was being congratulated by a fireman for his bravery and for saving his puppy. From then on he was determined to become a fireman. 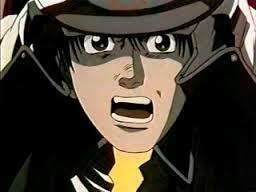 In the aftermath of the fire, the newspaper credits Daigo for saving the last people from the explosion, but notes that he was disobeying orders, and that his reckless actions have caused injuries in the past. At the station, Daigo and his superior Chief Gumi receive a reprimand, but not as serious as it might have been since Daigo did save lives. On the way out Gumi meets the reporter Okano, an acquaintance. They talk on a park bench. Okano says that Daigo was successful this time, but that it was due to luck rather than following procedure, and that sooner or later his recklessness will get someone killed. Okano intends to follow Daigo closely and note his grandstanding. Gumi can’t deny Okano’s criticisms, but he will still trust Daigo’s instincts. A week later, Daigo meets his best friend at the fire station, Shiro Amakasu, while looking for his dog Jiru. Daigo says that he might never have become a fireman if it hadn’t been for Jiru. Shiro is conflicted between admiration for Daigo’s bravery and fear for his safety. Over the following weeks, Daigo treats his suspension as a vacation. He heals and exercises. He meets his former high school teacher, Miss Shizuka Ochiai. He has a young crush on her. She is conflicted between wanting to encourage his compulsion to be a hero, and wanting to urge him to avoid getting into danger; between treating him like a little brother, and falling in love with him. Daigo continues to act recklessly and to ignore orders at fires. He pulls out a can of kerosene to keep it from exploding. He acts as though his heroism alone justifies his ignoring orders. The other firemen wonder how long his luck can continue. Sooner or later, he will get himself killed. The OAV is only halfway through at this point. The last half is all about fighting the fire at the Sengoku Civic Center. Megumi no Daigo was never released in the U.S. The OAV was produced in Japan by Shogakukan-Shueisha Productions from animation mostly by the minor studios Oh! Production and Studio Wanpack. In 2004 there was an 11-episode live-action TV series adaption of it, Fire Boys. Here, for comparison, are the OAV and the first half of the first episode of the live-action Fire Boys. You reminded me I have at least one volume of the manga in my collection. I don’t know why I didn’t get more but I suppose given this was the manga boom when it happened, there were more than enough other titles that I was after as well and those $10 books do add up! I see the manga’s still available from VIZ, albeit as digital copeis. I wouldn’t say the manga had no following, just a large cult, it sold well enough where Viz translated and published the entire series in an era where they still cancelled and didn’t finish low sellers (and even today Viz has re-released the whole series in digital form for those cult fans who have trouble finding the printed editions). However, the fact there is an OAV of it is quite the surprise! Just one of those coincidences where things either pick up momentum over time or not. I suppose or the OVA, there just wasn’t enough interest for another ‘coaster’ in the budget bin of Big Lots.